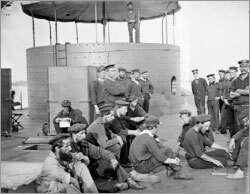 The idea of the USS Monitor was born amidst a nation in turmoil, as the Civil War ravaged the country. After discovering the Confederate Navy was constructing an impenetrable ironclad in Hampton Roads, Va., President Lincoln called for a naval board to propose construction of an ironclad vessel to lead the Union Navy. John Ericsson, a Swedish-American inventor, introduced a plan, which caught their attention. 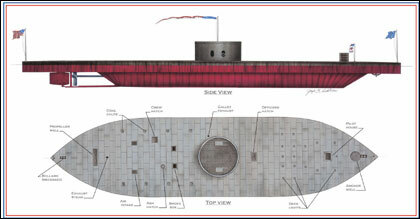 Complete with a rotating gun turret, low draft, sleek profile and Ericsson's claim as an "Impregnable Battery," the board was convinced to order swift production on what would become the USS Monitor. Construction immediately began at the Continental Ironworks in Greenpoint, Brooklyn, NY. 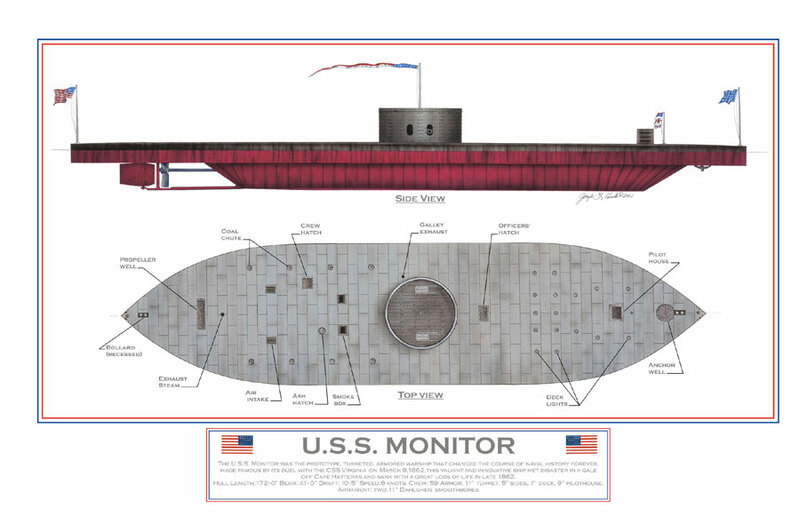 Almost 100 days later, on January 30, 1862, the USS Monitor was launched into the East River. As she began sea trials in the waters off New York City, the outline of her body was unlike anything seen before. All the engineering spaces, crew and officer quarters, galley and wardroom were located underneath the waterline. The Ericsson turret with her two 11-inch Dahlgren guns and the pilot box were the only items protruding from the horizon. She didn't look like much, but when it came time to test her might, she and her crew would earn their glory. The Union's biggest threat lived in Hampton Roads. The Confederate Navy had a stronghold on Norfolk, Va., and they had also constructed their own ironclad, the CSS Virginia. She was constructed over the modified hull of the USS Merrimack, a ship previously scuttled and burned by the Union when the Confederates took charge of Norfolk. They built stout iron sides at an angle above the original hull. She was a monstrous vessel, holding 5 times as many guns as the Monitor and she was launched on February 17, 1862. On March 8, 1862 the Monitor arrived in Hampton Roads towards the end of dusk. Unfortunately, a show of ironclad superiority over conventional wooden vessels had already taken place. Earlier that day, the CSS Virginia had free range at the wooden vessels of the Union fleet. Frigates Cumberland and Congress had been destroyed and the Minnesota damaged and stranded. The sky burned a fiery orange deep into the night as flames engulfed the deserted Congress, and the "Monitor Boys" prepared for their inevitable fight in the daylight to come. The CSS Virginia confidently prowled into the waters the next morning for more takings, but imagine the crew's surprise when they saw the unfamiliar outline of the Monitor in the distance. On this day, March 9, 1862, the story would be much different and history would be made as the clash of the ironclads commenced. The two ships approached each other cautiously, and as soon as each was in range, the firing boomed across Hampton Roads. For over four hours the battle ensued. The vessels frequently bombarded each other at pointblank range with no substantial damage to either ship. However, a shell exploded in the view-port of the Monitor's pilot house, temporarily blinding Captain John Worden. The Monitor's Executive Officer, Samuel Dana Green, assumed command and ordered the Monitor into shallow water, where the Virginia could not follow, to assess the captain's wounds and damage to the ship. The Virginia's captain, assuming the Monitor was withdrawing from battle, withdrew in supposed victory. When the Monitor returned to resume the engagement and found the Virginia gone, her crew also assumed victory. In reality, the battle was a virtual draw with neither vessel inflicting serious damage to the other. 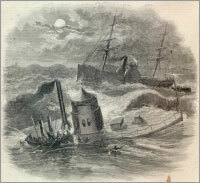 The Monitor was successful in protecting the stranded Minnesota from destruction, while the Virginia prevented the Monitor from advancing up the James River toward Richmond. Although the Monitor remained in Hampton Roads throughout the spring and summer of 1862, the two vessels never again met in battle. In May of that year, trapped between advancing Union forces and the bar at the mouth of the James River, the Virginia's crew destroyed her to prevent capture. Regardless of a decisive victor never dissolving in the match between the two ironclads, one outcome was distinctly clear: the worldwide strategies of naval warfare and shipbuilding were changed forever. Following the seizure of Norfolk by the Union forces, the strength and power of the Monitor and her now famous Ericsson turret, was needed further south. On December 29, 1862, she left Hampton Roads, along with the aid of a tug, the side-wheeler frigate USS Rhode Island. All was well until New Year's Eve when they were off the coast of Cape Hatteras, N.C. The waves grew and the wind howled. With each pitch and roll, shock waves ravaged the crew and the hull of the little ship. Leaks developed, flooding the engines and reducing steam pressure needed for propulsion. The crew tried using pumps and even bailing with buckets, but the distress was too great. The "Monitor Boys" raised the signal of distress, a red lantern, and the Rhode Island deployed their lifeboats in an effort to rescue the crew. The turret was the only escape hatch from below and as the men attempted dashing across the deck many of them were swept into the unknown by the treacherous waves. In the end, 16 of the brave men onboard the Monitor never met the year of 1863. Paymaster William Keeler was one of the lucky survivors. 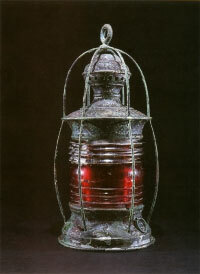 Standing safely on the decks of the Rhode Island he described watching the red lantern hanging on the turret of the Monitor as it disappeared and reappeared behind the turbulent waves. Each time it would come back to sight, he and his mates would cheer, for the Monitor still lived. Finally, the red lantern disappeared for the last time. Keeler wrote, "The Monitor is no more. What the fire of the enemy failed to do, the elements have accomplished."